This month, I will feature snapshots of black beauty history. Expect to see images, products, tastemakers, artists, models, and films that have shaped our world in terms of fashion and beauty today. Most casual students of black history know about historical hair product impresarios and entrepreneurs – women like Madame C.J Walker, Annie Malone and Madame N.A Franklin are known names that are celebrated parts of our history. But in terms of actual makeup products made for women of color back in the day, far less is known or widely discussed. This is not to say that before the 1970’s, makeup intended for black women didn’t exist. It did. These products may not have perfectly matched or blended, but there was makeup marketed towards women of color. 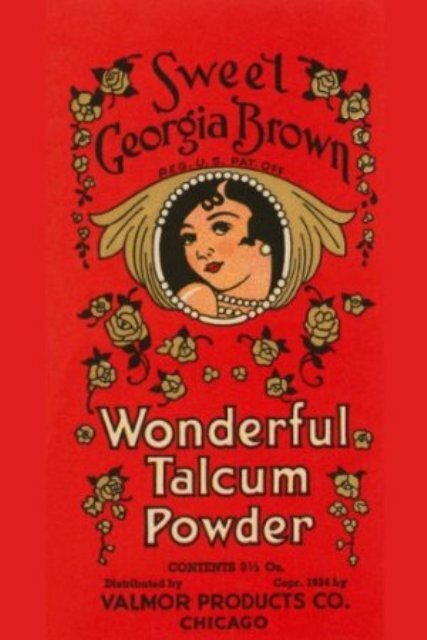 Many of the products were powders, or creams – such as Hi Hat powder which was made in Tennessee, and came in shades of “High Brown,” “Copper Bronze,” “Teezum Brown,” or “Toasted Chestnut.” Most often the packaging featured models with fair skin and straight hair, despite the target market. 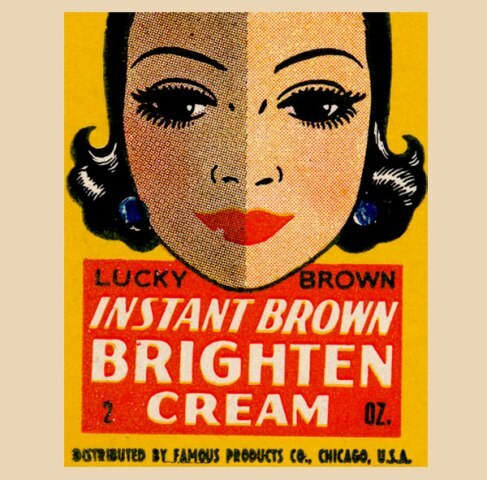 Lucky Brown Cosmetics were made by Valmor Products Co., out of Chicago — the brand’s founder was famed art collector Morton Neumann – he is also credited for having created the brand’s art, but according to this very informative blog, Charles C. Dawson did much of the artwork but received little of the credit. 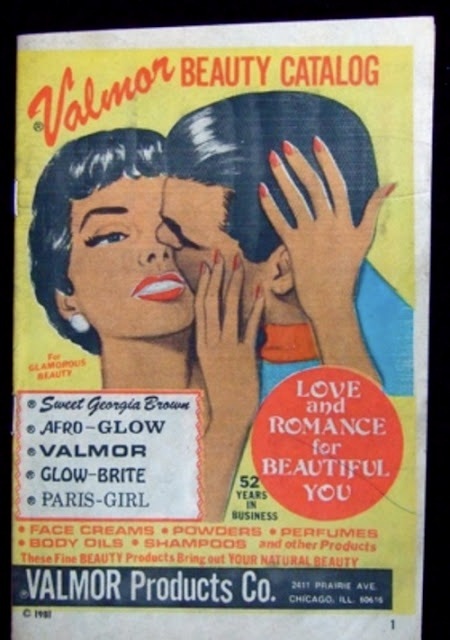 Valmor Products also produced Sweet Georgia Brown and Madame Jones brand products, which included things like powders and more controversial products like “brightening” night creams, as well as “black-o-lene” hair cream/coloring agent and “hair glow-ene” pomade. Posters for some of these items are available at BlackBettyPosters.com. I’ve also seen these kinds of vintage posters at the HQ of Chicago’s own Bronzeville Historical Society. 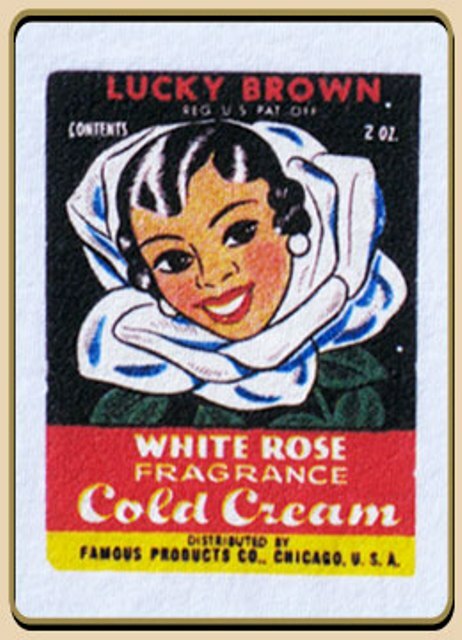 In the 20’s, 30’s, 40’s and 50’s, these were the kinds of cosmetics items being marketed to women of color, and this is how it was being marketed to us. In the 1970’s we saw the advent of a new era in cosmetics made for and marketed to black women who were embracing their identities and leaving these whitewashed images behind. I’ll get to those in another installment of 28 moments in black beauty history! Do you remember seeing any of these packages around? 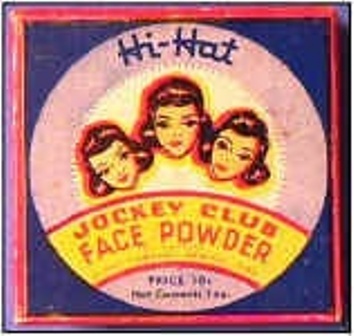 What products did your mothers or grandmothers use? I’m so fascinated by our beauty history and the lack of exposure of it online! Sabbio might I ask what book you were working out of the other day? I am writing a dissertation on similar topics and would love to hear where others are sourcing their information from. Wonderful article. It’s time to speak to my elders to get some history about their makeup back in the day….Thank you Queen for writing about a fascinating topic. Thank you so much for posting this. Interesting indeed! Great information for women (and men) this black history month. Thank you so much for this article. It is so difficult to find the history of makeup for black women,especially black women currently living in Africa.